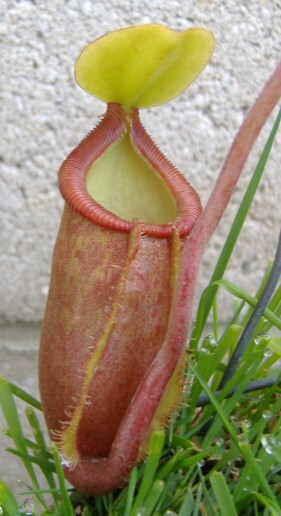 Nepenthes bellii X trusmadiensis is a hybrid between a lowlander and a highlander. Exotica Plants is producing some very nice hybrids with N. X trusmadiensis. This particular hybrid seems to be the most finicky of the N. X trusmadiensis hybrids so far. I've found out that the species N. bellii can be prone to transplant shock and sometimes a tadbit tempermental to grow. That's one of the reasons why this hybrid has needed more time of adjustment to my growing conditions than the other N. X trusmadiensis hybrids. As the plant matures I suspect the tendrils will get gangly similar to what N. bellii does. It hasn't gone through one of my winters yet so I may have to keep an eye on it for cold hardiness due to the lowlander influence. I have two of these hybrids so one plant may act differently than the other. For now, Exotica Plants doesn't have any photos of some of their larger plants in cultivation but that could change. Photos of other growers' clones in the Nepenthes forums appear similar to mine so I don't know if there's much variation within this hybrid. Although I grow this as a highlander, it could easily grow as an intermediate and maybe a lowlander. Keep an eye out for all hybrids from Exotica Plants that have N. X trusmadiensis in them because they are sure to be very stunning and hold their value for some time to come.